Pure Outdoor by Monoprice Emperor Tumbler, 20 fl. oz. Does it come with a straw or would it be compatible with a straw? BEST ANSWER: I'm not sure. If you're asking if if comes with a cover that has a straw built in??? No. If you just want to use a normal straw thru the regular cover. Yes, you can do that. But you would have to be careful about not tipping the tumbler sideways. 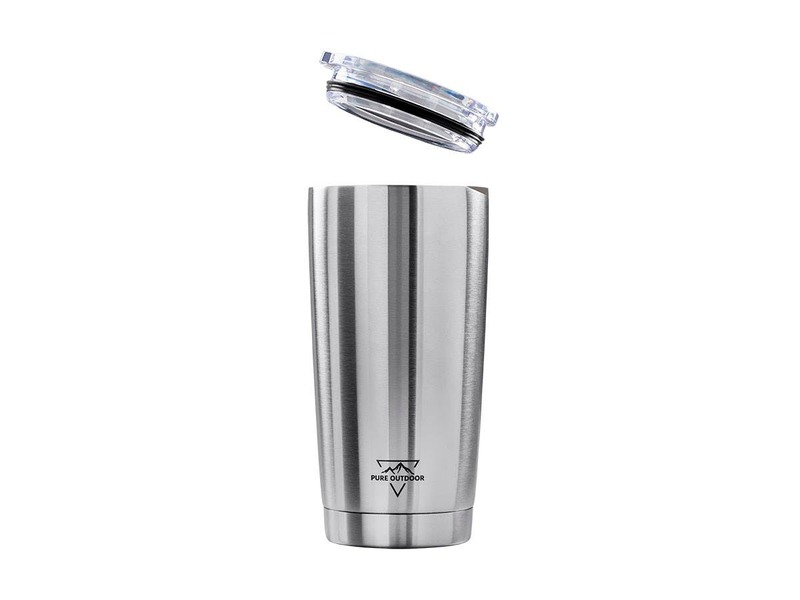 The tumbler holds its temperature pretty well, even without the lid on. I doubt 'Pure' makes a lid with only a straw opening, or a built in straw. But.... I have never checked.. It doesn't come with a straw. The cover is not cut out for a glass or hard plastic straw, though it works well with a disposable fast food straw. it does NOT come with a straw but I think one would fit in the slot used for the liquid to come out. These are Awesome for the price!! It does not come with a straw, but will accept smaller straws. The Tervis brand straws will fit very tightly, but can be squeezed in. It does not come with a straw. You could squeeze a small one in there, but it would be restricted a bit. It does not come with a straw. I am sure you can use one with it as long as it's a flexible straw. It doesn’t come with a straw. Though, you can use a non-rigid one through the lids sipping slot. 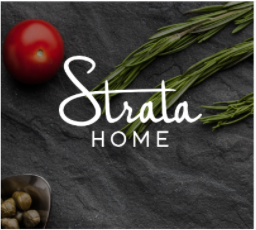 Doesn't come with straw, Not really designed for stray. Second picture shows slit in cap. Yes, it is compatible with a straw. My wife prefers to use it with a straw. It does not come with a straw but any standard straw would fit. Great cup. A straw is not included, but will fit thru the sipping hole in the cap. It does not come with a straw, bot the opening would be large enough. Is it stainless steel inside the tumbler? BEST ANSWER: Yes it is both inside and out. Yes, it is stainless steel inside the tumbler. The lid is plastic with a rubber gasket for the seal. Yes, it is all stainless, all stainless inside and out with insulation in between. I put ice and water in it the first time I tried it and the ice lasted from 10:00 PM until 3:00 PM the following day. Yes, it's SS throughout, no plastic except on see-through, press-fit lid. I bought a dozen of the 20oz tumblers, some for me, some for family, & some as gifts. They work great! Yes , having used it for a couple of weeks now , this tumbler is so far the best for keeping items hot . Very good product !! Same material inside and outside. Stainless steel but I cannot tell the type. 18/8? 17/4? 15/5? Who knows. Yes, it is double walled, stainless inside and out. It keeps coffee hot for hours. A great product. 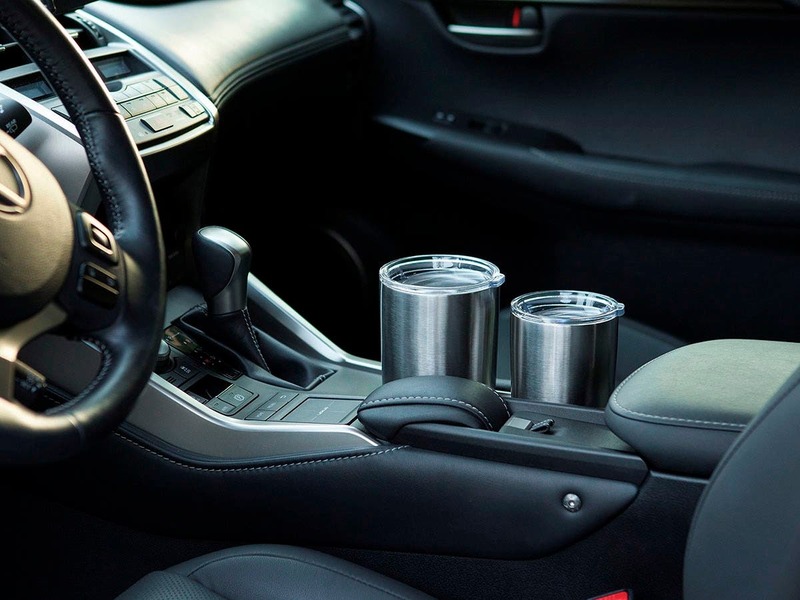 Yes it is, it appears identical to a Yeti tumbler I got from my Insurance agent. Yes! It's a nice mug. Do these seal when closed? For example if it tips over will the liquid run out? There is not a good picture of the lid to determine this. BEST ANSWER: It seals, but only with the friction from the rubber seal, which is not very tight. Thus, if it tips over, it is likely that the lid would fall off, spilling the contents. Even if the lid stayed in place it would loose contents through the drinking port, which cannot be sealed. I think it is a good buy for the money and am pleased with the purchase, but if it did not have these limitations, it would be a super buy. There is a drinking hole and a vent hole, will leak for sure. The lid is to help maintain the contents temperature, either hot or cold, and no it is not sealed. The contents will leak out when tilted enough to allow them to find the opening. It has happened to me before when trying to carry too many things at once. The tumbler was held against my torso by my left arm when I reached for an additional item and Boom!. Time for a dry shirt. Don't rust the sealable lid to prevent this from happening, it will just slow it down somewhat. Other than a somewhat "slick" bottom that can skid, slide or slip on hard surfaces, the tumbler is awesome, I have purchased several and use them for small gifts at gift exchanges, Xmas parties, etc. It keeps cold drinks better than hot beverages but I still use it for morning coffee. I give it 5 stars. Hope this helps. The top is clear plastic and has two holes in it. If it tips over, some spillage will occur. The top has a pressure fit, rubber seal. If that seal gets stuff on it (creamer or something similar) the seal is not very strong. It is a great cup despite all that. It keeps coffee hots most of the day. The lid has a tight seal, but the opening for the liquid (drinking port) remains open. If the tumbler tips over it would spill through the opening. On the positive side the lid has no moving parts making cleaning fairly easy. BUT be forewarned, the tumbler is NOT dishwasher safe! Yes it will run out , there is only a slot in the lid for the liquid to come out . Does not seal . But this is the best mug for hot liquids . Stays hot or warm for at least 4 hrs. ! I am very satisfied with it ! While the seal of the lid is not super tight, it is seated well enough to prevent spillage of liquid if the vessel is tipped over. No. It doesn't seal close. There is a small opening in the lid that allows you to drink from the tumbler. Drinking through the lid- is there an opening? Or some sort of closure? BEST ANSWER: Yes there is an opening for drinking as well as a small vent hole to allow air/liquid displacement. It is NOT spill proof. If you tip it enough, the contents will leak out. I use mine daily for coffee, occasionally for iced beverages. It keeps contents colder longer better than it keeps them hot. Hope this helps. There is a small opening in the lid, similar to any travel coffee mug but there is no closeure to seal it. However, this does not effect how well this product works in keeping your drinks cold for hours. I believe there are silicon plugs you can buy third-party to keep it from spilling. 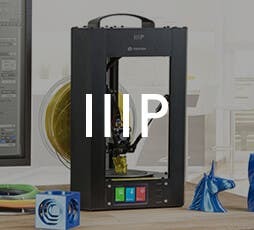 This would be a nice accessory for Monoprice to add at some point. I bought one of each size of these tumblers and have been very happy with them. Small opening - no closure to completely seal it. I have been surprised on how long it keeps stuff cold. Can keep ice in it for days, keeps coffee warm for most of the day. Great cup for the price. Cup is less than the replacement lid for the "major" player out there and just as good. There's an opening on the lid itself. 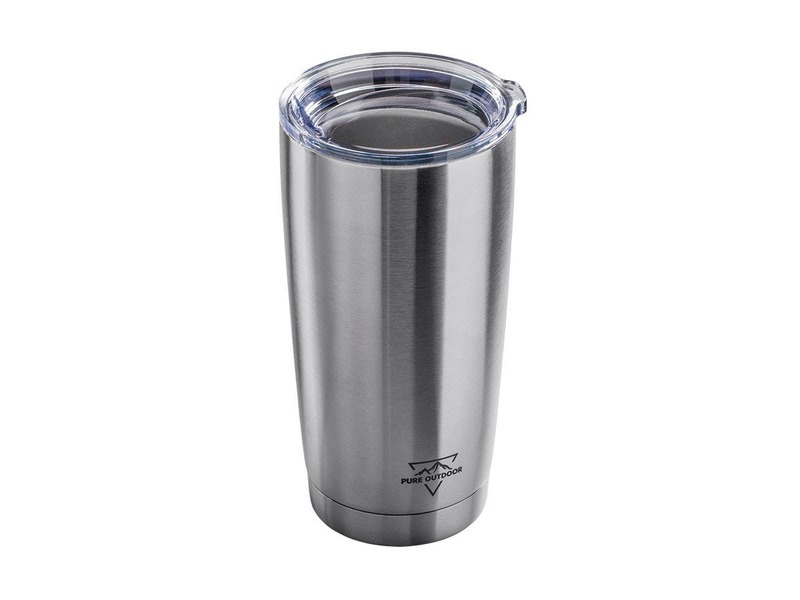 Are replacement lids available for this tumbler? 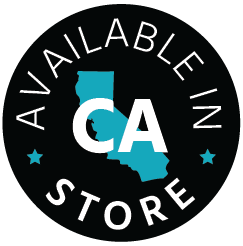 BEST ANSWER: We do not currently offer a lids as an accessory. If your lid was damaged and falls within the cups lifetime warranty, I recommend reaching out to our customer service team. 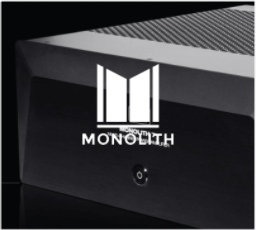 This has a lifetime warranty, so contact Monoprice customer support and see what they can do to replace it. If that doesn't work, just search Amazon for "20 oz tumbler lids" and you will find a lot of options that should fit it. It's the same size as a 20 oz Yeti or Ozark Trail tumbler. Yes. I bought lids off amazon that fit Yeti 20oz, and they fit great. I'd recommend a lid without a hole - one that seals. What is the dimensions of this item? Pure Outdoor by Monoprice Emperor Tumbler, 30 fl. oz. BEST ANSWER: Hello, thank you for your question. 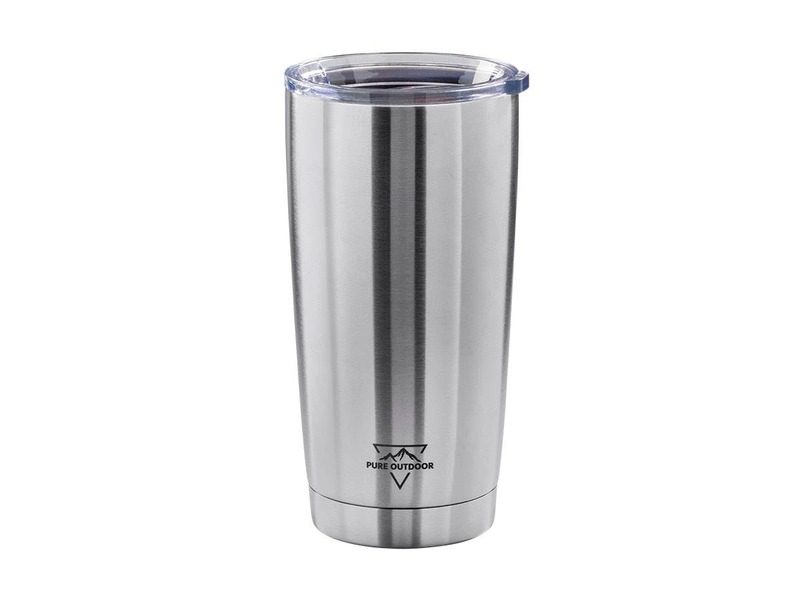 The tumbler dimensions are as follows; 30oz (15992) with lid 7 x 3.5 inches, Without Lid 6.835 x 3.5 inches. 20oz (15993) with lid 7.75 x 4 inches, without Lid 7.875 x 4 inches. MY question about the dimensions is what is the diameter at the bottom. I'm really most concerned about whether it will fit in my cupholder in my vehicle so I can make coffee in the morning and drink on the way to work and then take into work. I did not purchase the 30oz size, but the 20oz sizes are as follows: 2-3/4" diameter base, 3-7/16" diameter rim, 6-3/4" tall without lid. Lid brings height to 6-15/16 and adds a tab that protrudes 3/16". can I customize this 20 oz cup with a logo? 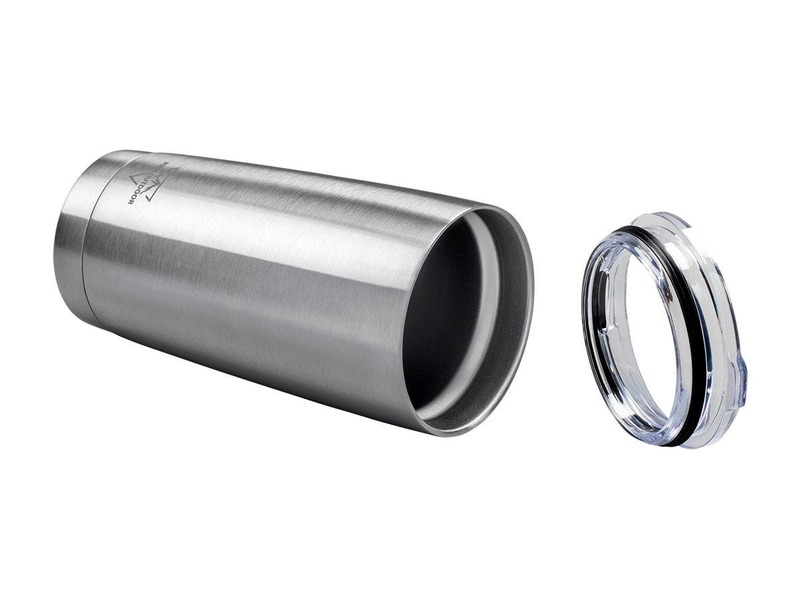 is the tumbler 18/8 stainless steel? Are there lids available for this tumbler that can close? Specifically the 20 oz. size. I love the cup but would like to be able to seal it to prevent spills. I lost a lid for the 20 oz cup. Where can I find a replacement ? I couldn’t be more pleased with how they look and perform. I bought both the 20 and 30 oz. cups. I filled the 20 oz. half full with ice and the rest with water for my drive to work this morning. I drank some of the water, but when I got back in my truck later in the afternoon to go home there was still one ice cube left and a lot of nice cold water even though the thermometer in my truck read 150 deg. F. All I can say is WOW! Keep beverages hot or cold for long periods of time. Save a buck and buy one of these! Great price. Most needed a good cleaning when opened. Great for drinks at the cabin. Works fantastic. Keeps both hot and cold beverages at the desired temperature for a long period of time. It works for a fraction of the cost for the same thing from Yeti! I got one for me and one for my wife and they work fine for us. I don't know how long they can keep things cold or hot because i have never needed one for more than a few hours, and they definitely work that long. Also, they are easy to clean. I wasn't sure if this would be good, but it works at keeping liquids either cold or hot. Good stuff. 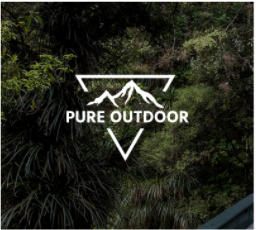 Pure Outdoor products have not disappointed me one bit. 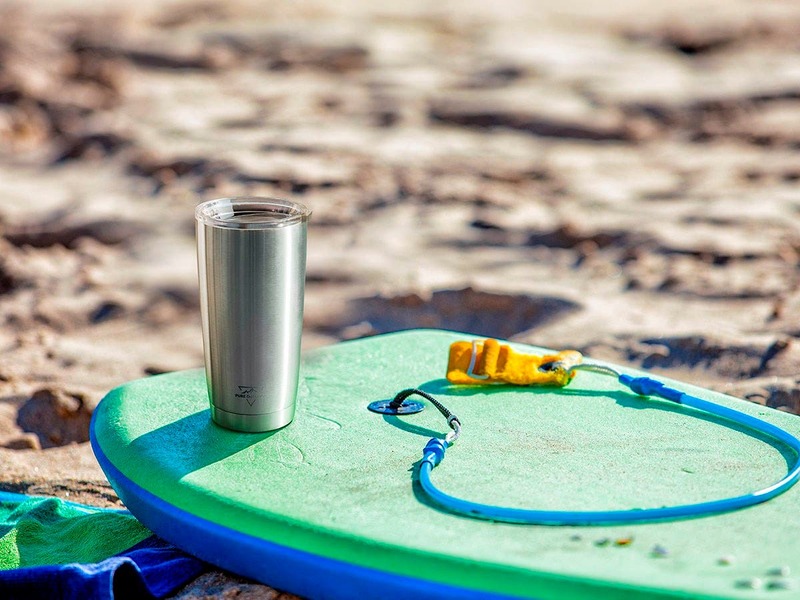 This tumbler has been my sidekick for a year plus - in travel, office use, and home use. I appreciate the price point and highly recommend. Keeps coffee hot much longer than my other cups. I've had a lot of so called insulated cups, but this one is the winner. I've left this cup in my car with hot coffee in it for several hours and returned to find that the coffee was almost as hot as it was when I poured it. Great buy for anyone who hates cold coffee.